Made these gorgeous quilts for a raffle. All proceeds go to a scholarship for needy students.Hope they get well received. It's about 50"x50". 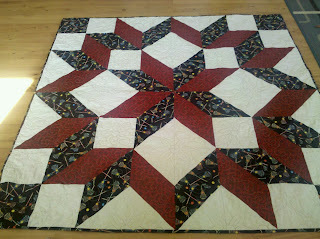 I had such fun quilting it and making it. 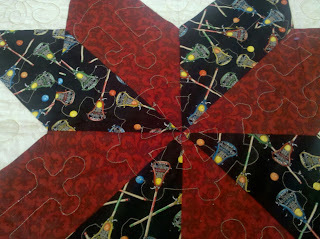 And a close up of the quilting. In the center points there's a ships wheel, and the stars each have an anchor. I quilted a couple other motifs in the cream squares. 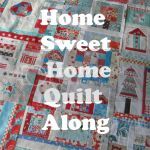 This other quilt was so quick and easy to make. Plus, I think it shows off the fabrics pretty well. I didn't do any fancy stitching in it, just some stippling. **Edited - one of my students won this one!! :) ** She loves it! 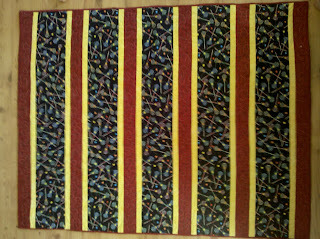 A huge thank you to Mary Quilts for the free pattern for the strippie quilt. Very fun, very easy.